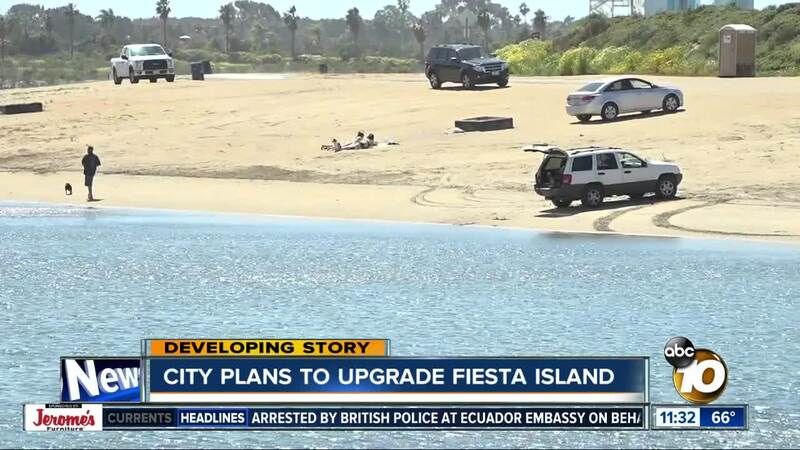 SAN DIEGO (KGTV) – San Diego’s Planning Commission heard from city staff Thursday regarding plans to potentially upgrade Fiesta Island in Mission Bay Park. The proposals are an amendment to the Mission Bay Park Master Plan to upgrade the overall vision and land uses for Fiesta Island. -- Option A: Includes a smaller fenced-in, off-leash dog park; park road extension that cuts through the dog park; parking lot; boat storage area; and a park adjacent to a swimming beach. 10News learned some local paddlers appear to favor Option A. -- Option B: Includes a bigger fenced-in, off-leash dog park; trails; and parking at the north and east perimeters of the area. City leaders want to bring in or improve recreation facilities, parking, trails, playgrounds, picnic areas and more along the 470 acres of island. Money to carry out potential upgrades would come from rising lease costs from SeaWorld, hotels and Mission Bay tenants. Carolyn Chase, president of Fiesta Island Dog Owners (FIDO), said Option B favors the dog park more than Option A. Team Survivor Sea Dragons, a group of paddlers who are cancer survivors, also spoke before the commission Thursday and asked that Option A be considered. The group said they need the Option A for proper beach access for their boats. They also said Option A has something for everyone, including San Diegans who use the dog park. If either option is adopted by the Planning Commission, it will be sent to the San Diego City Council and the California Coastal Commission for full approval. If no option is adopted, the ideas will go back to the drawing board.